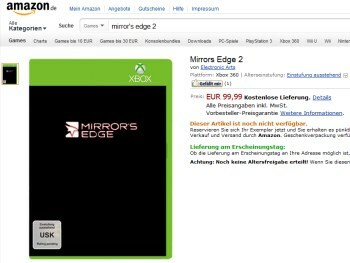 An entry for Mirror's Edge 2 has turned up on the German Amazon - and it's listed only for the Xbox. It's been five long years since DICE tried something different with Mirror's Edge, the parkour action game that was acclaimed by critics and gamers alike but nonetheless failed to set the sales charts on fire. Hope springs eternal and calls for a sequel have never gone away entirely, but while various DICE and EA executive types make vaguely encouraging noises about it now and then, the odds of a second Mirror's Edge actually happening has never seemed all that terribly likely. Take this with a grain of salt, then, or perhaps a handful, but a Mirror's Edge 2 listing has turned up on Amazon.de, which says it's not yet available or age rated, but is offering it for "reservation" right now. A couple of other relevant points: the site lists it for the Xbox 360 but the placeholder art suggests it's for the Xbox One, and either way it's hard to overlook the suggestion that it's a Microsoft exclusive; and the price is listed at €99.99, which works out to roughly $130. Wow. This is definitely something you'll want to look at with your Elton John-sized "Unverified Rumor" glasses on, but here's something else to keep in mind: EA Labels President Frank Gibeau said earlier this month that the company will be showing "new titles from EA Sports, BioWare and DICE and a first look at some brand-new games" at E3 next month. Mirror's Edge may not have been a big hit, but an Xbox One-exclusive sequel rolled out at E3 during the Microsoft press event? For those who follow such things, I don't think you'd find a much more powerful attention-grabber than that.